Muhammad Hosni El Sayed Mubarak (Arabic: محمد حسني السيد مبارك‎‎, Egyptian Arabic pronunciation: [mæˈħæmmæd ˈħosni (ʔe)sˈsæjjed moˈbɑːɾɑk], Muḥammad Ḥusnī Sayyid Mubārak ; born 4 May 1928) is a former Egyptian military and political leader who served as the fourth President of Egypt from 1981 to 2011. 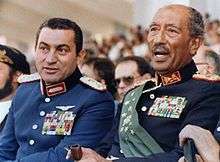 Before he entered politics, Mubarak was a career officer in the Egyptian Air Force. He served as its commander from 1972 to 1975 and rose to the rank of air chief marshal in 1973. Some time in the 1950s, he returned to the Air Force Academy as an instructor, remaining there until early 1959. He was appointed Vice-President of Egypt by President Anwar Sadat in 1975 and assumed the presidency on 14 October 1981, eight days after Sadat's assassination. Mubarak's presidency lasted almost thirty years, making him Egypt's longest-serving ruler since Muhammad Ali Pasha, who ruled the country from 1805 to 1848, a reign of 43 years. 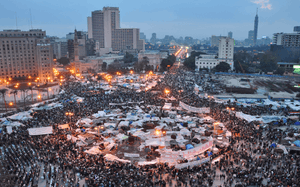 Mubarak stepped down after 18 days of demonstrations during the Egyptian Revolution of 2011. On 11 February 2011, Vice President Omar Suleiman announced that Mubarak had resigned as president and transferred authority to the Supreme Council of the Armed Forces. On 13 April 2011, a prosecutor ordered Mubarak and both of his sons (Alaa and Gamal) to be detained for 15 days of questioning about allegations of corruption and abuse of power. Mubarak was then ordered to stand trial on charges of negligence for failing to halt the killing of peaceful protesters during the revolution. These trials began on 3 August 2011. On 2 June 2012, an Egyptian court sentenced Mubarak to life imprisonment. After sentencing, he was reported to have suffered a series of health crises. On 13 January 2013, Egypt's Court of Cassation (the nation's high court of appeal) overturned Mubarak's sentence and ordered a retrial. On retrial, Mubarak and his sons were convicted on 9 May 2015 of corruption and given prison sentences. Mubarak is detained in a military hospital and his sons were freed 12 October 2015 by a Cairo court. In 1972, Mubarak became Commander of the Air Force and Egyptian Deputy Minister of Defense. On 6 October 1973, the Egyptian Air Force launched a surprise attack on Israeli soldiers on the east bank of the Suez Canal. Egyptian pilots hit 90% of their targets, making Mubarak a national hero. The next year he was promoted to Air Chief Marshal in recognition of service during the October War of 1973 against Israel. Mubarak was credited in some publications for Egypt's initial strong performance in the war. The Egyptian analyst Mohamed Hassanein Heikal said the Air Force played a mostly psychological role in the war, providing an inspirational sight for the Egyptian ground troops who carried out the crossing of the Suez Canal, rather than for any military necessity. However Mubarak's influence was also disputed by Shahdan El-Shazli, the daughter of the former Egyptian military Chief of Staff Saad el-Shazly. She said Mubarak exaggerated his role in the 1973 war. In an interview with the Egyptian independent newspaper Almasry Alyoum (26 February 2011), El-Shazli said Mubarak altered documents to take credit from her father for the initial success of the Egyptian forces in 1973. She also said photographs pertaining to the discussions in the military command room were altered and Saad El-Shazli was erased and replaced with Mubarak. She stated she intends to take legal action. Sadat also sent Mubarak to numerous meetings with foreign leaders outside the Arab world. Mubarak's political significance as Vice-President can be seen from a conversation held on 23 June 1975 between Foreign Minister Fahmy and US Ambassador Hermann Eilts. Fahmy told Eilts that "Mobarek [sic] is, for the time being at least, likely to be a regular participant in all sensitive meetings" and he advised the Ambassador not to antagonize Mubarak because he was Sadat's personal choice. Though supportive of Sadat's earlier efforts made to bring the Sinai Peninsula back into Egyptian control, Mubarak agreed with the views of various Arab figureheads and opposed the Camp David Accords for failing to address other issues relating to the Arab–Israeli conflict. Sadat even transferred his decisionmaking authority to Mubarak temporarily at times he went on vacations. Until Libya's suspension from the Arab League at the beginning of the Libyan Civil War, Egypt was the only state in the history of the organization to have had its membership suspended, because of President Sadat's peace treaty with Israel. In 1989, Egypt was re-admitted as a full member and the League's headquarters were moved to their original location in Cairo. President Mubarak was re-elected by majority votes in a referendum for successive terms on four occasions: in 1987, 1993, and 1999. No other candidates could run against the president because a restriction in the Egyptian constitution in which the People's Assembly played the main role in electing the President of the Republic. After increased domestic and international pressure for democratic reform in Egypt, Mubarak asked Parliament on 26 February 2005 to amend the constitution to allow multi-candidate presidential elections by September 2005. Previously, Mubarak secured his position by having himself nominated by Parliament then confirmed without opposition in a referendum. While in office, political corruption in the Mubarak administration's Ministry of the Interior rose dramatically. Political figures and young activists were imprisoned without trial. Illegal, undocumented, hidden detention facilities were established, and universities, mosques, and newspaper staff were rejected because of political inclination. Military officers were allowed to violate citizens' privacy using unconditioned arrests under Egypt's emergency law. Two and a half hours after Mubarak's resignation, an Egyptian military member came on air and thanked Mubarak for "putting the interests of the country first." The statement, which said "The Supreme Council is currently studying the situation," did not state what the council would do next. 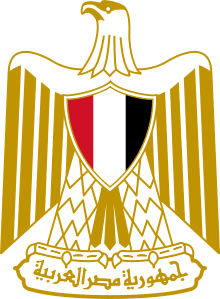 It was widely believed that the Egyptian military abandoned Mubarak in large part because his succession plan, which would put his sons (Alaa and Gamal) in power following his death, constituted a threat to the military's extensive economic, political and financial interests and its vast privileges in Egypt. For more details on this topic, see Trials and judicial hearings following the Egyptian Revolution of 2011 § Mubarak family. In January 2013, an appeals court overturned Mubarak's life sentence and ordered a retrial. He remained in custody and returned to court on 11 May 2013 for a retrial on charges of complicity in the murder of protesters. On 21 August 2013, a Cairo court ordered his release. Judicial sources confirmed that the court had upheld a petition from Mubarak's longtime lawyer that called for his release. A day later, interim prime minister Hazem el-Beblawi ordered that Mubarak be put under house arrest. Though mostly out of the public eye, Mubarak granted a rare interview in February 2014 with Kuwaiti journalist Fajer al-Saeed, expressing support for then-Minister of Defense and Commander-in-Chief of the Egyptian Armed Forces Abdel Fattah el-Sisi as the next President of Egypt, recognizing that Sisi was working to restore the confidence of the Egyptian people. "The people want Sisi, and the people's will shall prevail," Mubarak noted. Mubarak also expressed great admiration and gratitude towards the late Sheikh Zayed Bin Sultan al-Nahyan of the United Arab Emirates and his children, for their continuous support of Egypt and its people. However, Mubarak expressed his dislike of opposition politician Hamdeen Sabbahi, a Nasserist following the policies of Gamal Abdel Nasser. Hosni Mubarak is married to Suzanne Mubarak and has two sons: Alaa, and Gamal. Both sons served four years in Egyptian jail for corruption and were released in 2015. Through his son Alaa, Mubarak has two grandsons, Muhammed and Omar; and through his son Gamal, he has a granddaughter Farida. Muhammad died in 2014 from a fatal head injury. 1 2 3 4 5 6 7 8 "Air Marshal Mohammed Hosni Mubarak". Egyptian Armed Forces Web Site. Egyptian Armed Forces. Retrieved 30 May 2009. 1 2 Kirkpatrick, David D.; Shadid, Anthony; Cowell, Alan (11 February 2011). "Mubarak Steps Down, Ceding Power to Military". New York Times. Retrieved 11 February 2011. 1 2 Kirkpatrick, David D.; Stack, Liam (13 March 2011). "Prosecutors Order Mubarak and Sons Held". The New York Times. Retrieved 13 April 2011. 1 2 "Mubarak to be tried for murder of protesters". Reuters. 24 May 2011. Retrieved 24 May 2011. ↑ "Trial of Egypt's Hosni Mubarak starts". BBC. 3 August 2011. ↑ Egypt's Mubarak to get retrial. 3 News. Retrieved on 2014-01-16. 1 2 "Egypt's Hosni Mubarak jailed in corruption retrial". BBC News. 9 May 2015. Retrieved 9 May 2015. ↑ Associated Press (13 October 2015). "Jailed sons of Egypt's deposed leader Hosni Mubarak freed". ↑ "Profile: Egyptian President Hosni Mubarak". Xinhua News. 10 February 2010. Retrieved 11 February 2011. ↑ "Staff Group Captain Mohammed Hosni Mubarak". Egyptian Armed Forces Web Site. Egyptian Armed Forces. Retrieved 14 February 2011. ↑ de Borchgrave, Arnaud (2 February 2011). "The Mubarak legend – Longtime strongman can't withstand media barrage". The Washington Times. Retrieved 3 February 2011. ↑ "Middle East factfile: Key figures". The Daily Telegraph. UK. 15 January 2002. Retrieved 7 February 2011. ↑ "كتابات مصراوي – هيكل يفجر قنبلة مدوية حول لغز بقاء مبارك بشرم الشيخ". Masrawy. 21 February 2011. Retrieved 15 April 2011. 1 2 "Eilts to Kissinger, September 3, 1975". Retrieved 29 January 2011. ↑ "Hermann Eilts (US Ambassador to Egypt) to Henry Kissinger, September 5, 1975". Retrieved 29 January 2011. 1 2 3 4 5 6 Olfat M. El Tohamy (14 October 1981). "Egypt's Hosni Mubarak picks up Sadat's reins: profile". Christian Science Monitor. p. 2. Retrieved 23 January 2013. ↑ "Hermann Eilts to Henry Kissinger, December 31, 1975". Retrieved 29 January 2011. 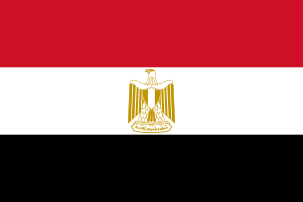 ↑ "Middle East – Country profiles – Country profile: Egypt". BBC News. BBC News. 17 November 2009. Retrieved 19 June 2007. ↑ "The IMF's model pupil". The Economist. 18 March 1999. Retrieved 19 June 2007. ↑ BBC, Profile: Hosni Mubarak. 22 August 2013. ↑ Wright, Lawrence (2007). The Looming Tower: Al Qaeda and the Road to 9/11. New York: Vintage Books. pp. 242–244. ISBN 1-4000-3084-6. ↑ Daniszewski, John (7 September 1999). "Man Killed After Injuring Mubarak". Los Angeles Times. Retrieved 1 February 2011. ↑ "Mubarak warns of '100 bin Ladens'". CNN. 31 March 2003. Retrieved 29 January 2011. ↑ "Mubarak: "U.S withdrawal would hurt Iraq"". USA Today. 9 April 2006. Retrieved 29 January 2011. ↑ "Mubarak opponents take to streets, allege rigging". LivePunjab. 12 September 2005. Retrieved 1 February 2011. ↑ Slackman, Michael (25 December 2005). "Testing Egypt, Mubarak Rival Is Sent to Jail". The New York Times. Retrieved 6 June 2009. ↑ Jane Mayer (30 October 2006). "The C.I.A. 's Travel Agent". The New Yorker. Retrieved 28 January 2011. ↑ Kalla Fakta (18 May 2004). "Striptease brevpapperl Agent". trojkan.se. Retrieved 28 January 2011. ↑ Jack Shenker (22 November 2010). "Egyptian elections: independents fight for hearts and minds in 'fixed ballot'". The Guardian. UK. Retrieved 28 January 2011. ↑ "Country Report – Egypt". freedomhouse.org. 2005. Retrieved 15 April 2011. ↑ "CPI 2010 table". Transparency International. Retrieved 26 October 2010. ↑ Kim, Susanna (2 February 2011). "Egypt's Mubarak likely to retain vast wealth". ABC News. Retrieved 3 February 2011. ↑ Dickey, Christopher (21 February 2011). "The Tragedy of Mubarak". Newsweek. p. 18. ↑ "Switzerland freezes assets of Mubarak.". Deccan Herald. ↑ "ط§ظ"ط£ظˆظ"ظ‰ – ط§ظ"ظ†ط§ط¦ط¨ ط§ظ"ط¹ط§ظ… ظٹط·ظ"ط¨ طھط¬ظ…ظٹط¯ ط£ط±طµط¯ط ظ…ط¨ط§ط±ظƒ ظˆط¹ط§ط¦ظ"طھظ‡". Ahram. Retrieved 15 April 2011. ↑ "تجميد أرصدة مبارك إجراء لإجباره على الخروج من مصر بعد رفضه مطالبات مسبقة, الدستور". Dostor. 22 February 2011. Retrieved 15 April 2011. ↑ "Egypt Issues Travel Ban, Asset Freeze on Mubarak". VOA. 28 February 2011. Retrieved 15 April 2011. 1 2 "Egypt's Mubarak gets three years in a graft case". Middle East Star. Retrieved 22 May 2014. 1 2 Scobey, Margaret (19 May 2009). "Scenesetter: President Mubarak's visit to Washington". WikiLeaks. WikiLeaks cable: 09CAIRO874. Archived from the original on 18 January 2011. Retrieved 18 January 2011. ↑ Shahine, Alaa (25 November 2010). "Egypt's Ruling Party Tightens Grip as Mubarak Succession Nears". Bloomberg L.P. Archived from the original on 19 January 2011. Retrieved 19 January 2011. ↑ Awolaja, Abiodun (24 March 2010). "Between Nigeria and Egypt's presidential crises". Nigerian Tribune. Archived from the original on 19 January 2011. Retrieved 19 January 2011. ↑ "حمدى السيد: جمال مبارك كان يدبر لانقلاب على أبيه بدعم العادلى – بوابة الشروق". Shorouk News. Retrieved 15 April 2011. ↑ Council of Arab States (1 October 2005). "The Arab Peace Initiative, 2002". al-bab.com. Retrieved 9 July 2008. ↑ Isabel Kershner (25 June 2008). "Rockets hit Israel, breaking Hamas truce". International Herald Tribune. 1 2 3 Bronner, Ethan (19 December 2008). "Gaza Truce May Be Revived by Necessity". New York Times. Retrieved 12 February 2009. ↑ "Mubarak blocks resistance Cairo conference". Socialist Worker. 12 May 2009. Retrieved 15 May 2009. ↑ Kevin Connolly (16 May 2009). "Egypt unrest: Hosni Mubarak vows to quit after polls". BBC. Retrieved 1 February 2011. ↑ "Factbox—World reaction to Egypt's Mubarak quitting in September". Reuters. 3 February 2011. Retrieved 3 February 2011. ↑ Wyre Davies (3 February 2011). "Egypt unrest: PM apologises for Tahrir Square violence". BBC News. Retrieved 5 February 2011. ↑ Paul Adams (10 February 2011). "Egypt protests: Hosni Mubarak to make TV address". BBC. Retrieved 12 February 2011. 1 2 3 'Egyptians celebrate a moment in history. Retrieved 12 February 2011. 1 2 BBC on Mubarak. Retrieved 12 February 2011. ↑ 'President Obama hails Mubarak's Resignation, Cites 'Moral Force of Non-Violence: Uncensored News. Retrieved 12 February 2011. ↑ "Egypt army reconsiders cases of jailed protesters". Yahoo. Retrieved 15 April 2011. ↑ "Ailing Mubarak wheeled into courtroom cage for trial". CNN. 3 August 2011. Retrieved 3 August 2011. ↑ "Egypt paper publishes 'Mubarak interview'". Retrieved 29 April 2016. ↑ Hennessy-Fiske, Molly; Hassan, Amro (29 May 2011). "Mubarak, other former Egypt officials fined $91 million for blocking cellphones, Internet". Los Angeles Times. Retrieved 29 May 2011. ↑ "Mubarak fined for mobile, Internet cut". The Egyptian Gazette. 28 May 2011. Archived from the original on 10 August 2011. Retrieved 29 May 2011. ↑ Afify, Heba; Fahim, Kareem (31 July 2011). "Judge Says TV Will Show Mubarak on Trial". The New York Times. Retrieved 31 July 2011. ↑ Hill, Evan (15 August 2011). "Mubarak trial reined in at second hearing". Al Jazeera. Retrieved 16 August 2011. Lawyers were forced to take their seats and submit their requests in writing, and Rifaat adjourned the case until 5 September, after issuing a terse series of 10 decisions on how the trial would proceed. ↑ Associated Press (21 January 2012). "Egypt's Hosni Mubarak Trial: Defense Concludes, Argues Ousted Leader Still President". Huffington Post. Retrieved 25 January 2012. ↑ "Mubarak jailed for protest deaths". BBC. 2 June 2012. Retrieved 2 June 2012. ↑ "Hosni Mubarak's sentence greeted with initial euphoria, then anger". The Guardian. 2 June 2012. 1 2 "Live updates: Thousands take to Egypt street protesting 'political' ruling in Mubarak case". Ahram online. 2 June 2012. Retrieved 2 June 2012. ↑ "Ousted Egyptian President Hosni Mubarak's retrial starts". BBC. Retrieved 11 May 2013. ↑ "Egypt to place Mubarak under house arrest". Times of Israel. 22 August 2013. Retrieved 9 January 2014. ↑ "Hosni Mubarak: Egypt court drops murder charges over 2011 killings". BBC News. BBC News. 29 November 2014. Retrieved 29 November 2014. ↑ "Egypt: Ex-ruler Hosni Mubarak, accused in deaths of hundreds, cleared of charges". CNN. CNN. 29 November 2014. Retrieved 29 November 2014. ↑ Egypt's high court overturns last conviction against Mubarak. Reuters. Retrieved on 2015-01-13. ↑ "Hosni Mubarak and Sons Sentenced to 3 Years in Prison, Likely to Go Free". NBC News. Reuters. 9 May 2015. Retrieved 10 May 2015. 1 2 Rohan, Brian (9 May 2015). "Egyptian court sentences former president Hosni Mubarak and sons to three years in prison for corruption". National Post. Retrieved 9 May 2015. ↑ Malsin, Jared (9 May 2015). "Egypt: Hosni Mubarak sentenced to three years in prison". The Guardian. Retrieved 9 May 2015. ↑ "Mubarak supports Sisi, slams Sabbahi in phone interview". Cairo Post. Retrieved 29 April 2016. ↑ "Report: Mubarak has fallen ill". The Jerusalem Post. 7 July 2010. Retrieved 14 February 2011. ↑ Evan Hill (21 November 2010). "The Muslim Brotherhood in flux – In Depth". Al Jazeera. Retrieved 28 January 2011. ↑ "Report: Egypt's Mubarak dying of cancer". UPI.com. 19 July 2010. Retrieved 1 February 2011. ↑ Norman, Joshua (13 February 2011). "Mubarak Mystery: In Egypt, in Germany, in Coma?". CBS. Retrieved 14 February 2011. ↑ "'Mubarak ailing, wants to die in Egypt'". Ynetnews. 15 February 2011. Retrieved 5 January 2012. ↑ "Ex-Egyptian President Hosni Mubarak near death: reports; protests flare up in Bahrain, Yemen". Daily News. New York. 15 February 2011. Retrieved 15 April 2011. ↑ "Former Egyptian President Mubarak hospitalized". CNN. 13 April 2011. Retrieved 15 April 2011. 1 2 "Hosni Mubarak Has Cancer". The Telegraph. London. 21 June 2011. Retrieved 21 June 2011. ↑ "Mubarak falls into coma after final speech: report". Al Arabiya. 13 July 2011. Retrieved 17 July 2001. ↑ News Desk (26 July 2011). "Egypt's ousted president Hosni Mubarak is reportedly depressed and refusing solid food". Global Post. Retrieved 5 January 2012. ↑ "Hosni Mubarak 'has a heart attack' while taken to prison". Daily Telegraph. 2 June 2012. Retrieved 2 June 2012. ↑ "Mubarak has heart attack on way to jail". AP via News24. 2 June 2012. Retrieved 2 June 2012. ↑ "Doctors twice use defibrillator on Egypt's Mubarak". CTV Montreal. 11 June 2012. Retrieved 11 June 2012. ↑ "Hosni Mubarak 'defibrillated after heart stops'". Daily Telegraphl. 11 June 2012. Retrieved 11 June 2012. 1 2 "Hosni Mubarak breaks leg in jail". the Guardian. Retrieved 29 April 2016. ↑ Lily Kuo (4 April 2016). "Africa loses more money to illicit financial flows than it receives in foreign aid". Quartz. ↑ "Indian Council for Cultural Relations, Universe of Culture, Promoting Indian Culture, Showcasing World Cultures". Iccrindia. Retrieved 28 January 2011. ↑ "Dostluk İlişkilerine Katkının Altın Sembolü: Devlet ve Cumhuriyet Nişanları (Turkish) - The Gold Symbol Contribution of Friendly Relations : State and Republic Orders". Haberler.com. February 2013. Retrieved 26 October 2015. 1 2 3 4 5 6 "Egyptian Air Force – Air Marshal Mohammed Hosni Mubarak". Archived from the original on 23 December 2008.